After missing last years Great Canadian Beer Festival it looked like a good time to reacquaint myself with the largest Beer Festival on Vancouver Island (and one of the largest in BC). Like every year the festival was a two day event with a Friday that ran from 3pm-8pm and the Saturday Noon-5pm and was held at the Royal Athletic Park in Victoria. Much like last time I was not able to make it out to the Friday event and only the Saturday because of work and bad/late planning on my part. Tickets ran at $40 per day and you got a pamphlet with all of the breweries and beers available and a beer glass. Beer tokens came in at a fairly average BC price of $1.5 which got you a 4oz pour of beer. 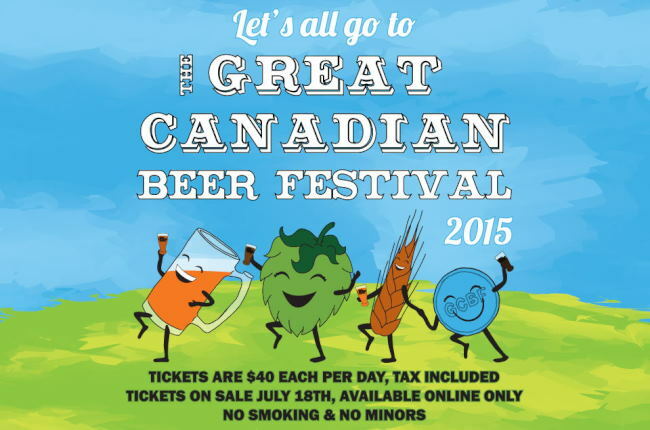 This years festival has reverted back to Canadian only Breweries with the vast majority being from British Columbia. I personally like to bring in American breweries because its a good way to compare our brews to some of the most renowned in the world (but that’s just me). There were still a ton of breweries at the festival with a total of 62. 33 Acres, Bad Tattoo, Barkerville, Big Rock(AB, BC), Bomber, Brasseurs Sans Gluten, Bridge Brewing, Cannery Brewing, Canoe Brewpub, Category 12, Central City Brewers & Distillers, Coal Harbour, Cumberland, Dageraad, Dead Frog, Deep Cove, Dieu Du Ciel, Doan’s Craft Brewing Company, Driftwood, Fernie, Four Mile, Four Winds, Fuggles & Warlock, Gladstone, Granville Island, Howe Sound, Hoyne, Les Trois Mousquetaires, Le Trou De Diable, Lighthouse, Axe & Barrel, Longwood, Merridale Cider, Mill Street, Moody Ales, Muskoka, Okanagan Springs, Parallel 49, Persephone, Phillips, Postmark, Powell Street, R & B, Red Arrow, REd Truck, Russell, Salt Spring Island Ales, Sherwood Mountain, Spinnakers, Stanley Park, Steam Whistle, Steamworks, Steel & Oak, Strange Fellows, Swans Brewpub, Tofino, Townsite, Tree Brewing, Unibroue, Vancouver Island, Wheelhouse, Wolf, Yellow Dog, Yukon. With a selection of breweries as far north of Victoria as a 2,490km drive and as far East as 4,805km away this festival did a good job of bringing Canadian breweries out to share their beer! In previous years I kept a log of the beers that I was enjoying but this year I decided against it. I did take many photos of the beer I was enjoying but not all of them as I would hold up the line while doing it. Once again the costumes were out in full force as well as the entertainment. There were lots of familiar faces all around but there were so many people I knew were there but missed. This event is planned and executed very well and is a ton of fun but I found that there might have been to many people. Some of the breweries had lines that you would be lucky if they only took you 10-15 minutes to get a beer sample. Fuggles & Warlock Craftworks beat this with a line so long that I didn’t even say hi to the guys at the booth it stretched so long! I hear the Friday event was much less crowded but I did not get to check that night out. Overall I had an epic time and I look forward to what next year has to offer! This entry was posted in Beer Travel, Tasting Event and tagged 33 Acres, Axe & Barrel, Bad Tattoo, Barkerville, bc, beer festival, Big Rock, Bomber, Brasseurs Sans Gluten, breweries, brewery, bridge brewing, canada, cannery brewing, canoe brewpub, Category 12, central city brewers & distillers, Coal Harbour, craft beer, Cumberland, dageraad, dead frog, Deep Cove, dieu du ciel, doan's craft brewing company, Driftwood, fernie, Four Mile, four winds, Fuggles & Warlock, GCBF, Gladstone, granville island, great canadian beer fest, Great Canadian Beer Festival, howe sound, Hoyne, Le Trou De Diable, Les Trois Mousquetaires, lighthouse, Longwood, merridale cider, Mill Street, moody ales, muskoka, Okanagan Springs, parallel 49, Persephone, phillips, Postmark, powell street, R & B, Red Arrow, red truck, royal athletic park, russell, salt spring island ales, Sherwood Mountain, spinnakers, stanley park, steam whistle, steamworks, Steel & Oak, strange fellows, swans brewpub, Tofino, Townsite, tree brewing, Unibroue, vancouver island, victoria, Wheelhouse, Wolf, yellow dog, yukon.